It isn't too hard to imagine a time when an over-weaning government declared an un-ending war against an abstract noun and used that war to invade its citizen's privacy and over-ride their constitutional protections. But I suppose there is some savage comfort in knowing that there are no new challenges that haven't already been overcome. And as the protagonist of this new movie tells us, there are no heroes or villains, just ordinary people victimised by the terrible choices they should never have been asked to make. So let us turn to the particular. It's the late 1940s and America is in a Cold War with the Soviet Union. It's government has decided to investigate communist party members at home, despite the fact that it is not illegal to be a member of the Communist party. In Hollywood, a group of right wing fearful and powerful individuals - including Ronald Reagan and the influential gossip columnist Hedda Hopper - make it their business to expose the Communists and blackmail any studio who hires them with picket lines and protests. They might act from a misplaced sense of patriotism but the tactics are dirty, and hint at the latent anti-semitism in the Hollywood system at the time. The Blacklist hits many professionals - some better able to withstand its pressures - emotionally, physically, financially. One of its richer victims was the screenwriter Dalton Trumbo, who with the "Hollywood 10" refused to give evidence to Congress, was imprisoned for contempt, and prevented from working under his own name. Out of prison, he spent a decade writing scripts under pseudonyms for hack studios and hack money, watching others pick up the two Oscars his talent earned. Finally, the gossip spread, and the Blacklist was undermined by the very difficulty of policing it. Kirk Douglas and Otto Preminger took a stand, and their very star power allowed them to get away with it. But not before many people - not just in Hollywood but beyond - had lost jobs, marriages and health. All of which might make TRUMBO sound like an earnest but dull film, railing against injustice of the House Un-american Activities Committee. 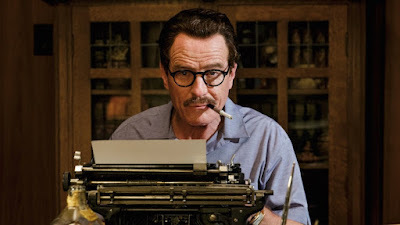 But I promise you that TRUMBO is one of the funniest movies you'll see this year. It's anchored by a superb performance from Bryan Cranston (BREAKING BAD) as the screenwriter with a fine line in wisecracking put-downs. He's abetted by Louis CK as his more dishevelled and distraught colleague, and John Goodman in brilliant form as a fearless B-movie producer who kept most of the blacklisted writers in business through the 1950s. Helen Mirren is enjoyably spiky as the horrible Hedda Hopper, but maybe not played as darkly as she might have been. And Michael Stuhlbarg is tragic as the big screen actor who snitched. The only folk who get a raw deal are the wife and daughter, played by Diane Lane and Elle Fanning, who are basically supportive and anonymous throughout the movie's running time. The result is a movie as funny as it is important, and one that casts recent historical events through the prism of Hollywood. I rather wonder whether this will flatter the egos of the Academy voters and turn a very fine film into an award winner. If so, I do hope Michael Stuhlbarg and Louis CK get as much recognition as Cranston. TRUMBO has a running time of 124 minutes. TRUMBO played Toronto and London 2015 and will be released in the USA on November 6th and in the UK on January 22nd.